It’s a ghastly night, a night that’s fills with much fright. Nothing seems quit right. In a neighborhood that is lit only by moon light. The clouds, ominous in shape, fill with blackness so dark it sends a chill, even through those who live by candlelight. Covering the streets that lay frozen to frostbite. 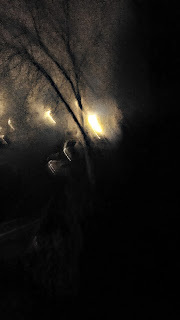 Each block feels of ghosts and ghouls gushing from frosty misted air, dancing, between clouded lights. And on this street stands a lonesome mansion, crooked, tangled in vines, a sight far from polite. It sits alone forced against a long twisted road. Crowded by crooked trees, bare of any leaves, choked by arid nights. And prying eyes from swamps filled with the smells of rotted troglodyte. Wolves howl at the narrowing sky. Not a single soul dare come by, for they fear, their soul will die. Stories are told of this mysterious home, stories long and old. Stories that leave you awake a night. Stories that leave the soul ghastly and white. Stories of a family that lives to create fear conjured in twilight. Even stories of a lonely angry troll who sold an old mans soul to inherit this hellhole home. But this angry lonely troll, no single eye has ever seen its soul. Some stories more frightful than others, all far from being delightful. Its said that a young girl, whom never grew old, once walked the streets deciding to leap inside this spine tingling home. They say she searched for excitement in exploring such a frightful frontier. But its told she slipped, fell, and blood came from pouring from her ear. Only to be found by the troll and kept as a sentimental souvenir. But still, no creatures ever seem to appear. And to this day, in the neighbor of frightful fear and the unclear. It’s said, the girl can be heard, crying, along side the old man and the angry lonely troll, whom once sold a soul to inherit this crooked old home. What is your favorite scary story? Comment below and let me know!